When Mike from Yonkers informed our group that he would not be available to choose our next food destination due to a “family emergency,” I sent out a electronic telegram to all our member for a quick substitute. “I got a place,” Gerry responded almost immediately. The place Gerry got for us was located in Yonkers, ironically, minus Mike from Yonkers. 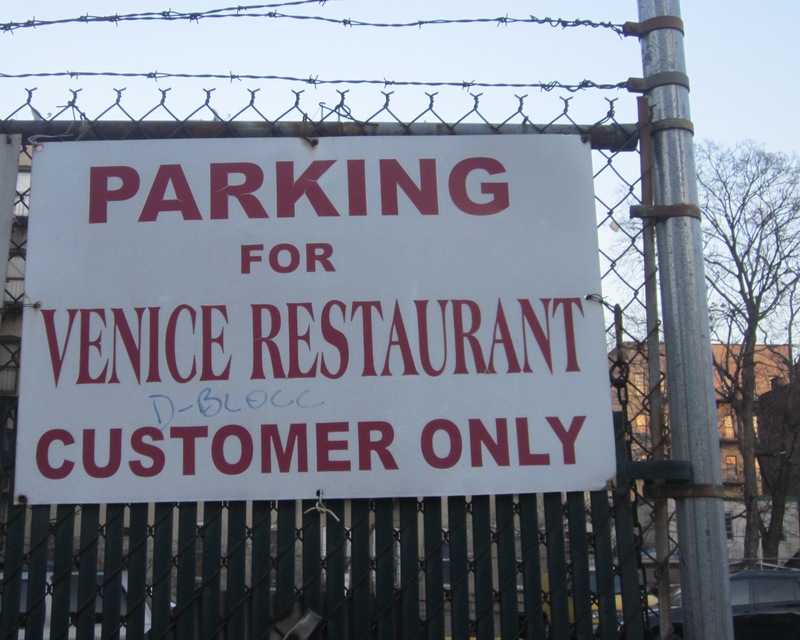 On a dilapidated stretch of Broadway prevalent with Dollar stores and Mexican delis, Gerry discovered Silvio’s, an ancient old school red sauce Italian joint that none of the Westchester contingent, meaning Eugene, had ever been to. The dining room, adjacent to the restaurant’s pizzeria, was empty except for our small group and because it was so quiet, the canned Italian red sauce music; Sinatra, Dean Martin, Jerry Vale, and others was even more obtrusive. As soon as we were settled, our waitress, a buoyant Latina, brought us nicely toasted, hard crusted Italian bread with packets of butter that Eugene quickly opened to spread on the warm bread leaving a litter of butter packets surrounding his place setting. The menu also had that old, 1950’s feel including the prices which seemed to be amended only slightly since Silvio’s first came to Yonkers. It wasn’t until we got our bill at the end of our meal that we discovered that those prices somehow found their way into the 21st Century—so much so that once again Gerry had brought us to a place where we were substantially over our allotted $20 budget. Maybe it was the Tito’s vodka Gerry ordered that tipped our scale—or the large slice of cheesecake (made the Italian way with sweetened ricotta cheese) that did it. Most probably, it was our gluttony that pushed us over the limit. We couldn’t help but order two appetizers, including a large order of clams oreganata with chopped clams and mussels in white wine and garlic. What made the final tally harder to take was that both appetizers were very disappointing; the mussels minuscule and the clams, when you could find them, buried deep under a heavy layer of moist breadcrumbs tough and seemingly fresh out of a can. The pastas appeared inexpensive on the menu but, of course, we couldn’t stick to the traditional menu, instead we ordered a rigatoni Calabrese from the “special” menu, a heavily sauced pasta with tomato sauce, cherry tomatoes, and sausage. There was nothing traditional about the combination of scungilli and calamari with linguini unless you considered canned scungilli traditional. You would think two pastas might be enough for us but it wasn’t even close and, honestly, there was much more sauce than pasta on both platters and the sauce just wasn’t curbing our sizable appetites. 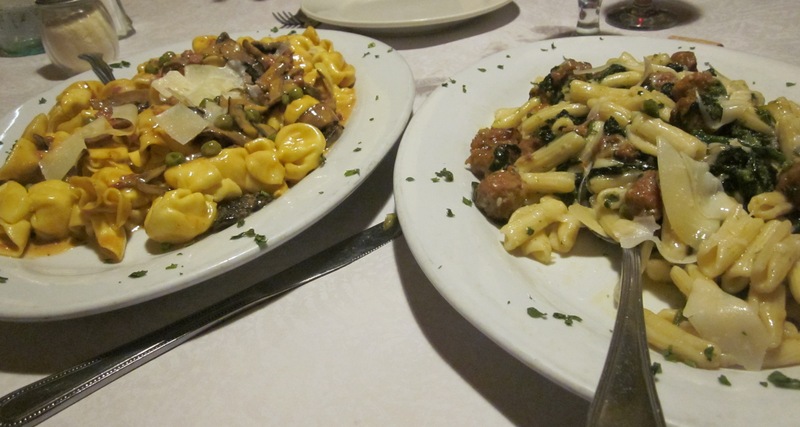 We rounded out our meal with a beef braciole; one single braciole smothered in red sauce, a platter of veal Francese that included four small, pounded scallopini’s, one for each of us, in a lemony wine butter sauce and sides of broccoli and spinach. The morsels of veal, light and tender, was probably the best of what we had at Silvio’s and easily devoured. When the waitress returned to ask if we wanted dessert and before we could order what Gerry already knew would be the cheesecake, Eugene asked where Silvio was. “You just missed him,” our waitress said with a smile. 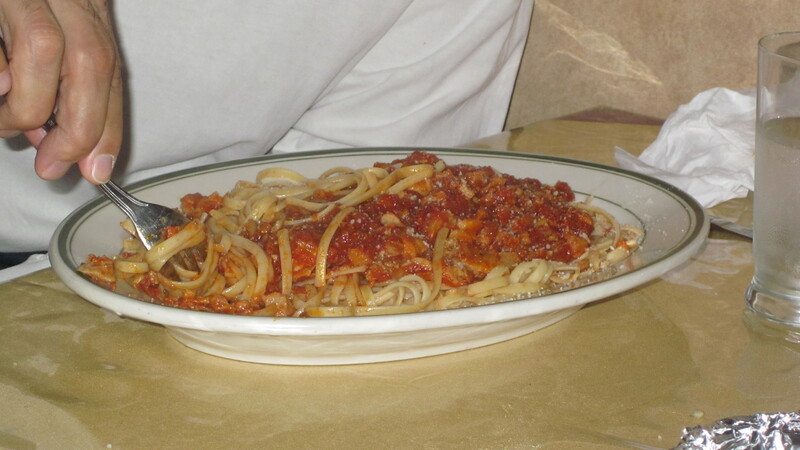 I wondered if there really was a Silvio or was he, like the Sinatra music and the old school menu, a fictional creation to fit into the Italian red sauce fantasy we never tired of, yet so often were disappointed by. After last month’s “disaster” in Port Chester and as the designated Grand Poobah of our now 15-year-old food group, I quickly signed into order a temporary ban on Mexican restaurants for our group. No more tacos. No more enchiladas. No more grand volcanoes until further notice. Despite a mini-protest by the sudden activist, Eugene, no one dared question my motives or intentions. Eugene soon fell into line and Mike from Yonkers, whose turn it was to choose our next destination stuck to the ban and chose a Korean restaurant in Flushing’s Koreatown called Joah. While we have had enough of guacamole for awhile, we were starved for bulgogi and bibimbap. I arrived early and had time for a beer, so I stumbled into a non-descript bar across the street from Joah. When I entered, the few heads in the bar turned to stare at me as if I were some sort of immigrant life form they had never seen before. There was a Korean couple at one end of the bar snuggled close to each other sharing cherry tomatoes and a bottle of Grey Goose and a lone older Korean man with three empty Coors’ Light bottles in front of him, two of the Korean female bartenders huddled around him lovingly. One of the bartenders reluctantly broke away to see what I wanted. I mentioned beer and she looked at me quizzically as if she didn’t understand what I said. And then she mimicked my words; her English almost non-existent. I dared not ask what type of beers were available and just went ahead and ordered a Heineken. She nodded and returned with a glass, a bottle of Heineken and a small dish of roasted peanuts. As I started in on the beer and the peanuts a loud wail ensued seemingly out of nowhere. I turned to see the man with the cherry tomatoes and Grey Goose bottle gripping a microphone. He was soulfully crooning into the microphone, the vodka fueling his passion as he sang along with the Korean pop tune. I made sure to applaud his performance politely when he finished and then, trying not to look too stressed, downed the beer as fast as I could and got out of there before I had to hear more karaoke, Korean or otherwise. The quiet when I arrived at the sparsely populated Joah was appreciated. Zio waddled in a few minutes later and we sat and took a look at the menu which was a colorful notebook loaded with non-traditional Korean dishes. Where was the bulgogi? Where was the bibimbap? 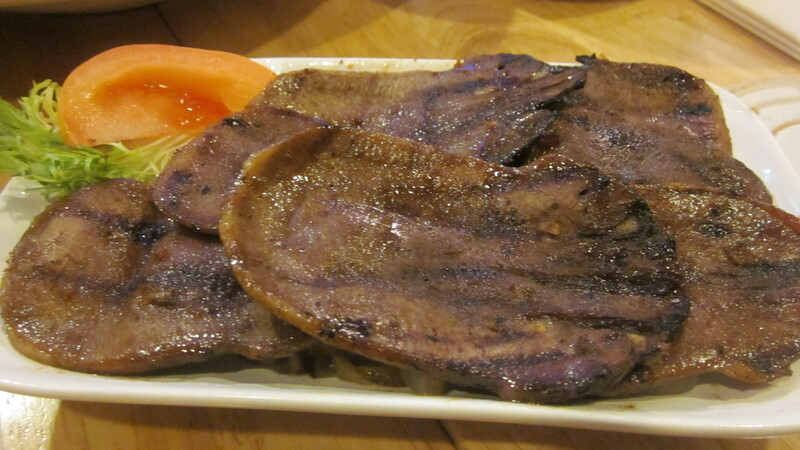 Instead there was page devoted to “hamburger steak,” including Turkish hamburger steak and hamburger steak and sausage. 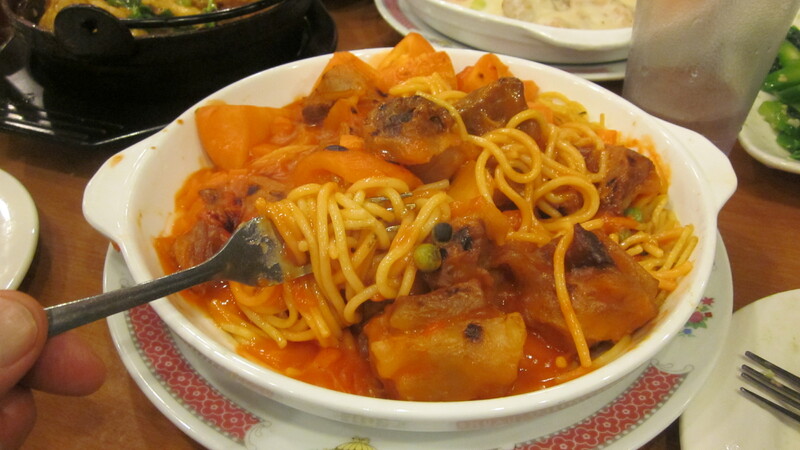 There was also a lengthy section of the menu on risottos and pastas; just what was expected in a Korean joint. “You gonna get pasta, Eugene?” I asked him. “No, I’m gonna get risotto,” he replied, surprising me as he ordered the “Gondre” seafood risotto in a tomato sauce. “That’s what I was gonna order,” Mike from Yonkers whined. “No one’s stopping you,” Eugene answered. And no one did. Both ordered the same risotto in a Korean restaurant. I quickly decided that the Korean version of Italian food might be problematic to an Italian food snob like me, so instead focused on something I had never seen before called “Eggs in Heaven OR Eggs in Hell.” The difference between heaven and hell in this case meant that the eggs were either prepared in a cheese cream sauce (heaven) or in a tomato broth (hell). Though the idea of hell always sounds edgier, more exciting, I opted for more mundane heaven; eggs in a Korean made tomato sauce just did not appeal to my half Italian sensibilities. Gerry wasted no time ordering the army stew, a soup of bacon, fish cake, sausage and noodles in the same, dark red tomato broth that coated Eugene and Mike from Yonkers’ risotto. “It’s a little sweet,” all of them, including Zio, whose spicy pork plate over rice was also red in color, intoned and I agreed after taking a bite of Mike from Yonkers’ risotto. There was nothing sweet, however, about my eggs in heaven. “Make sure you mix it all up,” the waiter told me as he planted the very hot bowl in front of me. I did what he said, the eggs cooking in the hot cheese and cream sauce, all of it easy to scoop up with the saltine crackers and pieces of Italian bread that decorated the bowl. The bits of bacon in the eggs added much needed salt to the otherwise bland, yet somewhat comforting dish. 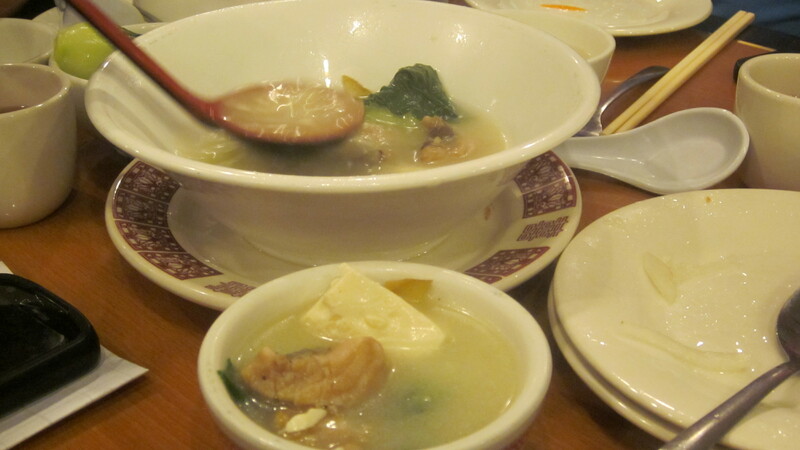 Though we came expecting Korean food normalcy, we experienced something much different. The results may not have been what we wanted, but the adventure most definitely was. In that regard, Mike from Yonkers’ pick of Joah was a big time winner. 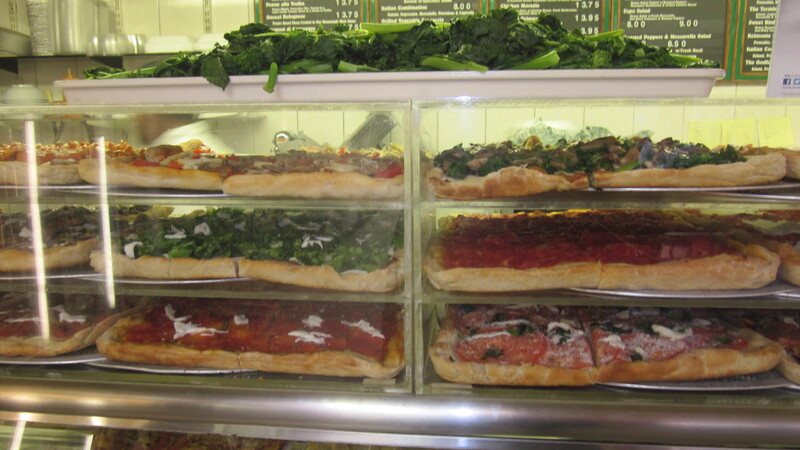 Welcome to Luigi’s Prima Pizza & Pasta where we serve the best in Italian-American cuisine. Come to our lively, festive restaurant where our beautiful hostess Felicia will show you to your table. Felicia, from Calabria, speaks no English, so Felicia…no capicia. But if you have any questions on the menu, Angelina, the waitress (at the pitzzeria) will be glad to answer them. Here is a sample of Luigi’s award-winning menu. *Extra mozzarella, the way my cucuzza likes it, add $1. *Comes with one meatball. Extras are $2 each. *A glass of ice water free with every banana split order. 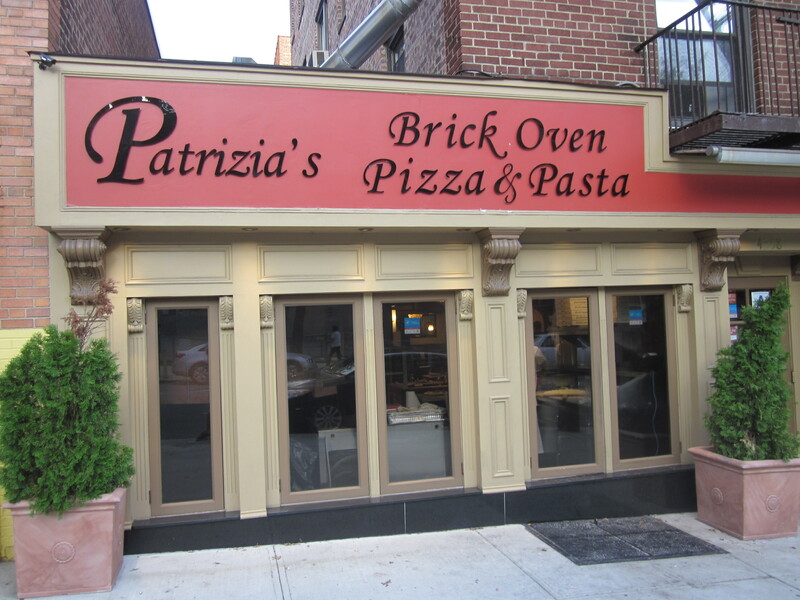 “You better come very hungry,” Gerry warned us all in preparation for our impromptu dinner at a place called Patrizia’s in the Woodlawn section of the Bronx. This deviation from our normal gathering routine where we take turns finding a restaurants that meet our budget requirements of $20 or less per person was based on Gerry’s insistence that Patrizia’s, though for our frugal selves, costly, worth the added expense. What was this Patrizia’s place Gerry was so high on and how come I hadn’t heard of it if it was as good as he claimed. Sure it was hidden in an Irish enclave of Woodlawn, but with today’s media, social and otherwise, a restaurant would be hard pressed to find itself “under the radar,” as we used to say when such places existed. Only Zio, who was assigned grandfather duty by the demanding and uncompromising Colonel, could not make it. Rick, a rare presence at our normal gatherings, even made it a point to drive to the Bronx on this pleasant August evening. As we entered, Eugene, who has an uncanny memory for faces and names from his illustrious Battle Hill childhood, stopped short when the owner of Patrizia’s, greeted Gerry, his longtime business associate. Carmine Sunshine shrugged as if he had no clue. And then the two men hugged. “This is the guy that wouldn’t let me buy a slice at Sunshine Pizza,” Eugene said to us as we witnessed the reunion. “I felt guilty going in there. 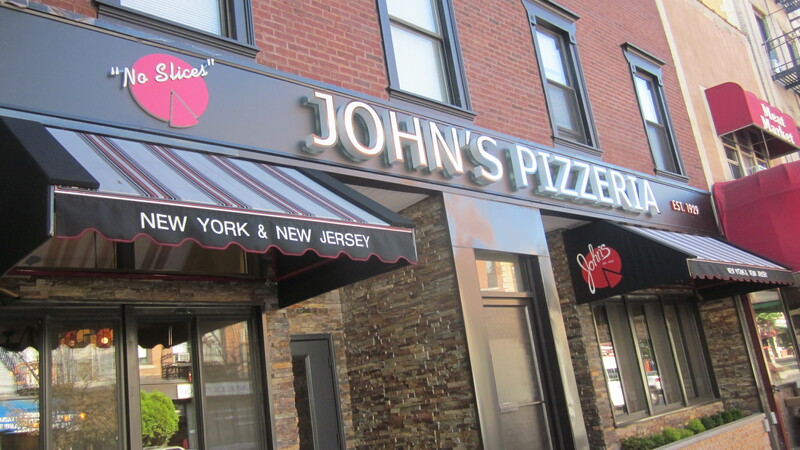 He wouldn’t take my money.” The connection, I was quickly to learn was that Carmine, the current owner of Patrizia’s was once the owner of a very popular pizzeria in downtown White Plains called Sunshine Pizza. Only Rick responded with a feeble, “Um…pine nuts. I can’t eat pine nuts. Carmine nodded and headed off to the kitchen. “Do we order?” Mike from Yonkers asked Gerry. “Oh he will,” Gerry responded, indicating he knew something we didn’t. First to arrive on the table was a small pizza made in the restaurant’s wood burning oven. I have a faint recollection of Sunshine Pizza, but one thing I am sure of, that slice joint never had a wood burning oven. Carmine’s pizza was crisp, layered lightly with cheese and tomato sauce. It was a winning start. Following the pizza, a waiter deposited a platter of coconut crusted shrimp on our table. “This is the first time I can truly say I’ve had anything with coconut in an Italian restaurant,” I announced. “Yeah, what was Carmine thinking?” Gerry wondered as he speared one of the jumbo shrimp and shoveled it into his mouth. 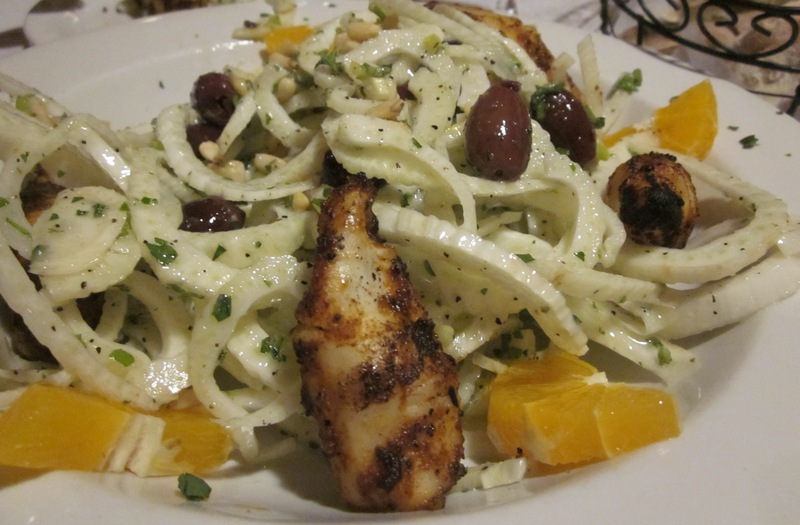 Carmine himself brought the next course; a fennel salad adorned with grilled calamari and dusted with…pignoli nuts. After presenting it he slapped the side of his own head realizing his mistake with the inclusion of the pine nuts and their toxic effect on Rick. “Okay, I’ll bring something else,” he stammered and while all but Rick sampled the aromatic fennel salad, he returned quickly with an overflowing platter of steamed little neck clams. “Just ‘cause your allergic to pine nuts doesn’t mean you’re getting all those clams,” Gerry barked as he spooned a few onto his plate drizzling them with their own broth. 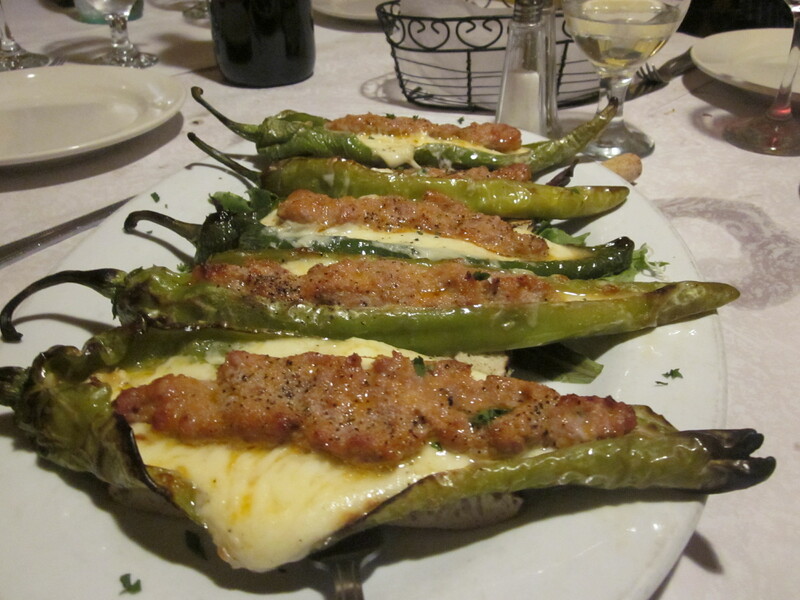 Before we could finish with the clams and fennel salad, another waiter presented a platter of roasted Italian peppers stuffed with cheese and sausage. With the previous four courses consumed the hunger that I was told to bring by Gerry had now faded, but that didn’t stop me from devouring one of the peppers, the saltiness of the sausage complimenting the sweet pepper and the mild mozzarella. I sipped a glass of wine from the magnum of Cabernet on our table hoping to clear my palate and reintroduce that hunger before the next course but there was no time. Carmine appeared like a sadistic inquisitor with a platter of octopus cooked in his fiery wood burning oven. How could I resist? I looked at Gerry. 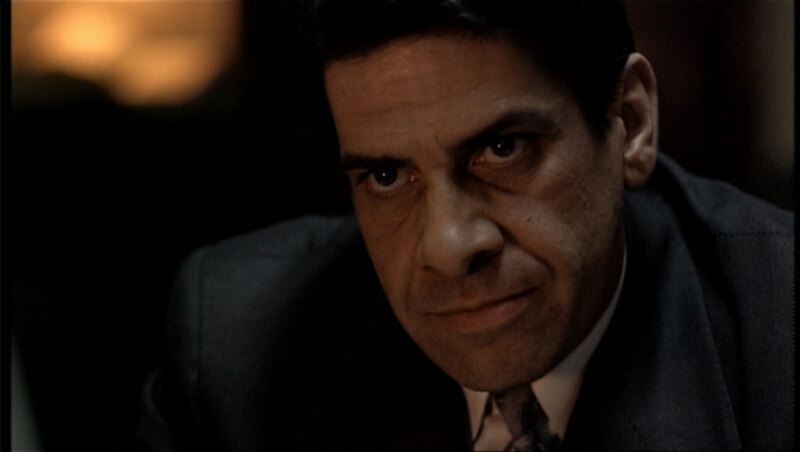 “Is this man planning to kill us here, so close to Woodlawn Cemetery,” I asked once Carmine was out of sight. And that was what I feared. I drank water and got up to go to the bathroom mainly just to stretch my legs and work off the first five courses. 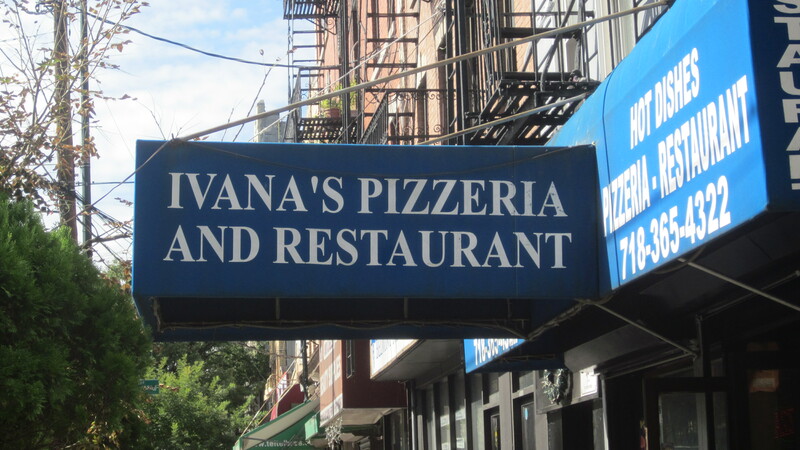 When I returned, there was a “family-size” platter of homemade cavatelli with more of that salty sausage and broccoli rabe sitting alongside another platter of what Carmine explained were “money bags,” or golf ball size dumplings stuffed with four cheeses in a rich mushroom and ham sauce. Both pastas were spectacular but also weighty on my already swollen belly. That didn’t stop me or others in my “family” from quickly consuming what had been assembled on the family-sized platters. I paused to breath. I knew there was more to come. After all we had really only dined so far on the “primi,” even though the “primi” courses were coming perilously close to double digits. Money bags on the left, cavatelli on the right. “The pizza oven?” I asked. Any excuse to get up and move; to stretch and work off whatever I could of what I’d already eaten was more than welcome. 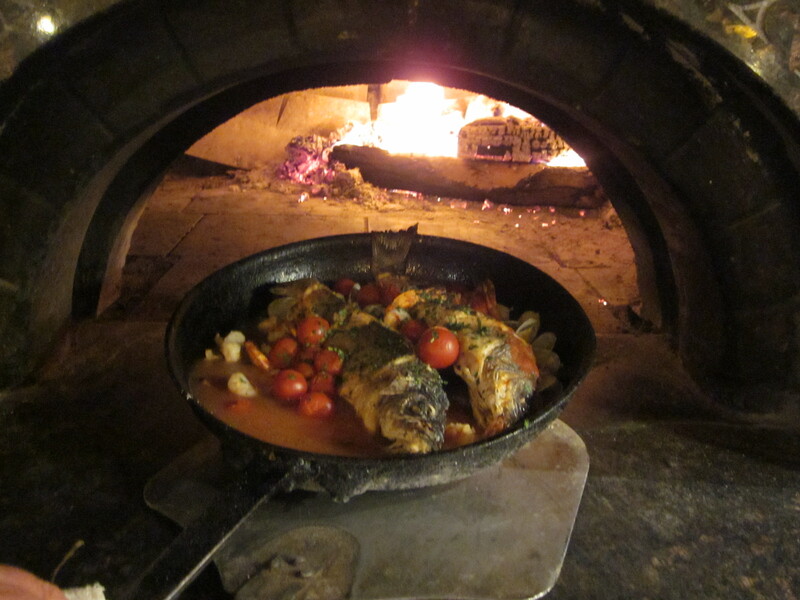 In a pan close to the glowing embers were two huge branzino, also known as sea bass, juices simmering in the heat of the oven. They looked beautiful and momentarily revived my appetite. I lingered for a bit there, not wanting to get back to food quite yet even though I had a responsibility to fulfill. When I returned to the table I saw, at least to my ancient eyes, what looked like a football covered in brown gravy. 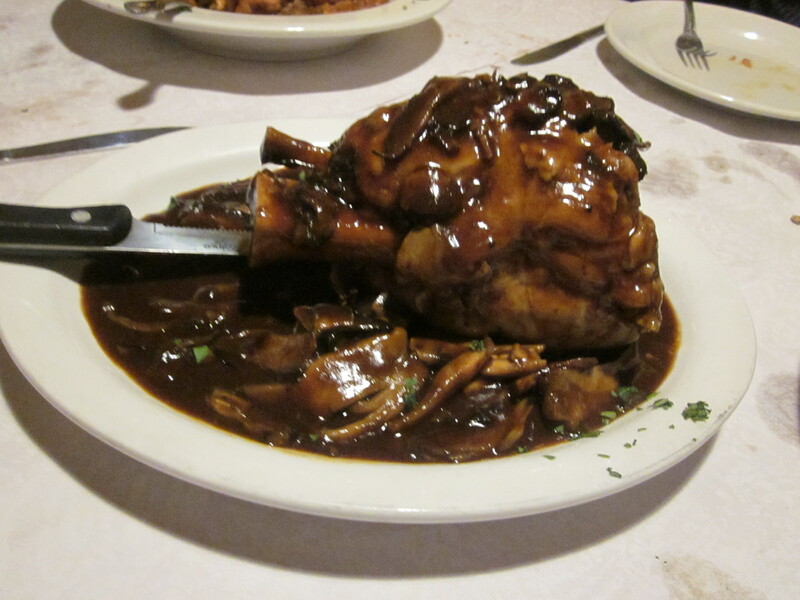 Upon closer inspection what was on the table was really an enormous shank of osso buco and it had been placed in front of my seat reminding me that there was work yet to be done. Mike from Yonkers was now eating standing up and groaning while continually shoveling food into his mouth. Two huge bowls of chicken, potatoes and vinegar peppers just added to the decadent misery we were experiencing. I picked at a pepper. I broke off a piece of the tender veal shank and nibbled at it. And then finally the branzino arrived—each fish in an individual platter coated in a light tomato sauce and topped with shrimp and clams. I pierced the skin of the fish and scooped out the white moist meat not bothering with the clams or shrimp. I just wanted to say I at least tried the fish. And then I couldn’t help myself. I filleted a little more and, finding reserves I never knew I had, finished it off. I turned to Gerry. “If he comes back tell him ‘no mas,’” I pleaded. “Yeah I’m done,” Rick muttered, a dazed look on his face. Only Eugene remained unfazed by the feast. He was still glowing over the blast from the past in seeing Carmine. “He wouldn’t let me buy a slice? I couldn’t go in there anymore,” he repeated again as if we didn’t hear him either the first or second time he mentioned it. Carmine slid into the booth again. “What about a steak,” he whispered to Gerry. Gerry laughed and swiped his finger across his neck signifying that we were done. A fruit platter followed and then, the finale, pastries, stuffed with molten dark chocolate cooked in the wood oven and topped with powdered sugar. I summoned my reserves and found room for both. Mike from Yonkers took the Branzino that was untouched home to his betrothed while Gerry and I went out with doggie bags of the chicken and potatoes. Nothing remained on the shank of veal that was once osso buco. And all the money bags somehow had been disposed of as well. We thanked Carmine Sunshine. Eugene gave him another hug. “I’ll see you in another 30 years,” he joked. “Next time I’ll make you a steak,” he told all of us and maybe it was the short stroll to my car on now desolate Katonah Avenue that momentarily gave me a second wind, or maybe I had more in my reserve than I thought, because by the time I got into the car returning for a steak actually sounded like a good idea. 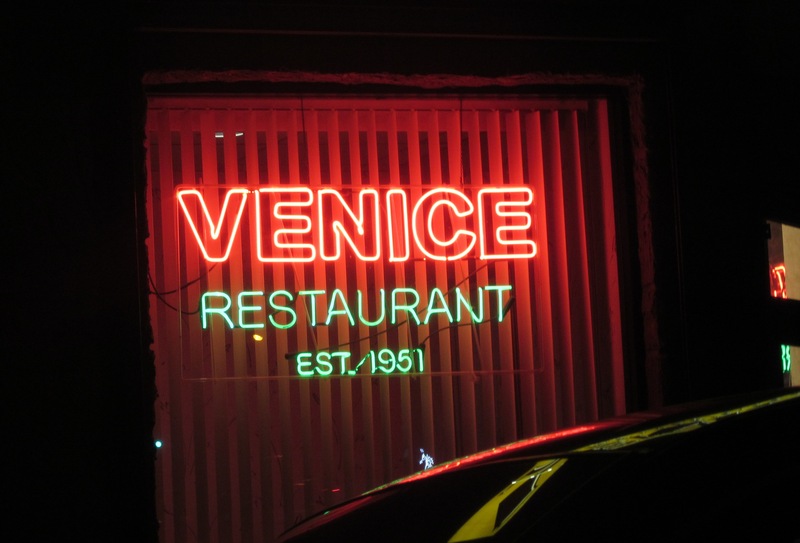 I pulled into Venice Restaurant’s private parking lot just off 149th Street in the Bronx and noticed its neon sign claiming the restaurant’s establishment as 1951. 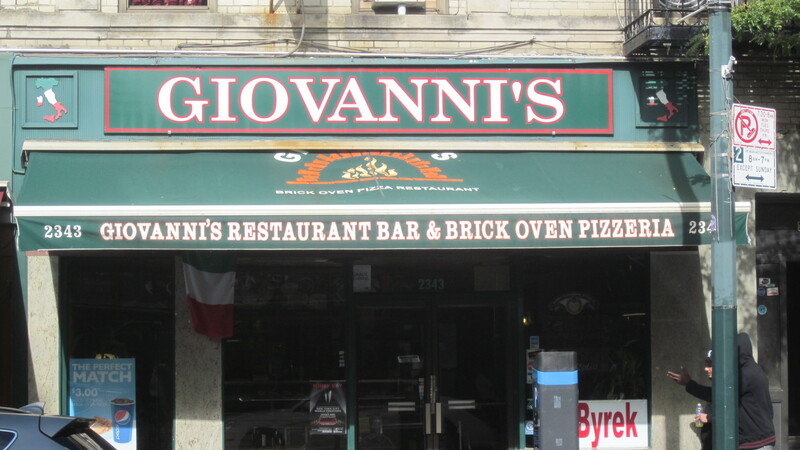 How did an Italian restaurant in the Bronx that had been around for 63 years escape my radar? I was ashamed of myself. “At work we take out from there every two weeks,” proclaimed Eugene in an email after Rick chose Venice Restaurant. Unlike the rest of us, to the grizzled Eugene, the restaurant was no secret. With Rick back after a hiatus, this was the first time our group was fully assembled in over six months. The rust was evident as Rick first suggested a few restaurants that just did not meet our criteria including one our group, without Rick, previously visited. He finally settled on the Venice for its old school “red sauce” appeal. And there was nothing wrong with that as far as I was concerned. And that it had its own private (under 24-hour video surveillance) parking lot just added to the appeal. The dining room had images of Venice painted over the walls while the tables were covered in mustard-colored glossy vinyl. 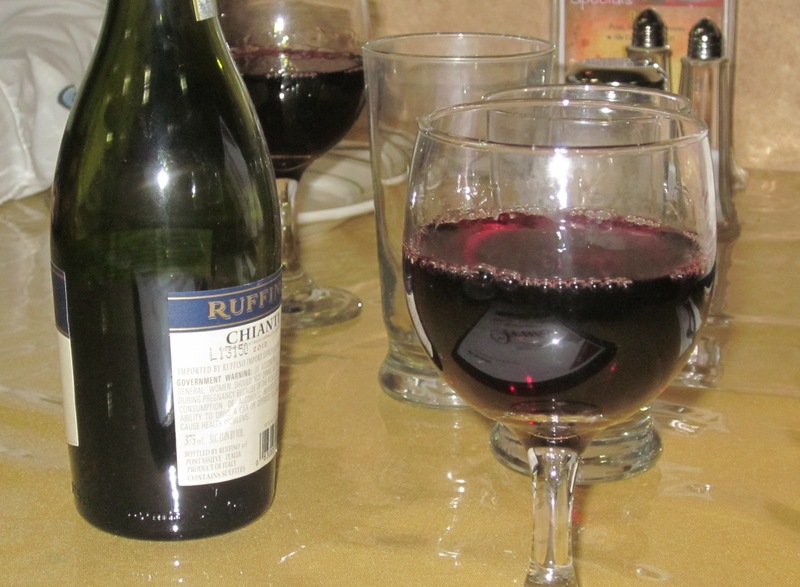 Rick wasted no time in adding to the atmosphere by ordering a glass of Chianti. Old school red sauce aside, Gerry and I took advantage of the restaurant’s full bar and instead ordered Swedish vodka. “How’s the Italian food in this restaurant,” I couldn’t resist asking Eugene, whose swarthy features were actually very similar to those of Sollazzo the Turk. But, for whatever reason, Eugene was a bit slow and didn’t get the reference. So instead of responding with, “Try the veal. 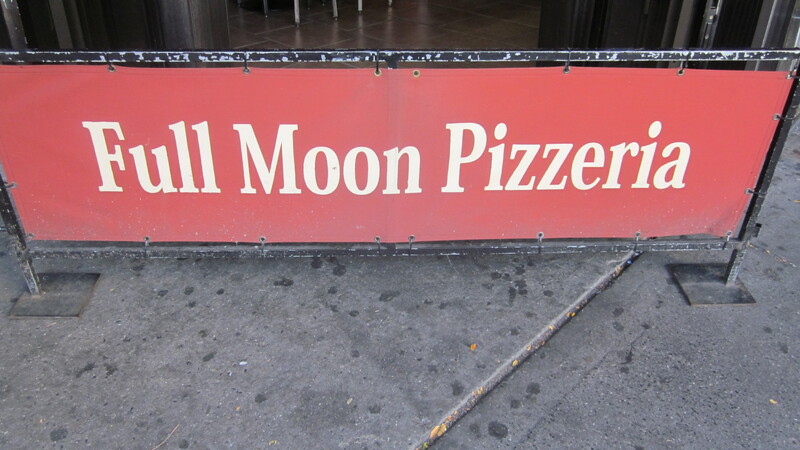 It’s the best in the city,” he just shrugged and reminded us that he only had take out. He did, however, whisper to Gerry that the fried calamari wasn’t very good. We stayed away from the fried calamari but couldn’t resist the seafood salad and baked clams. 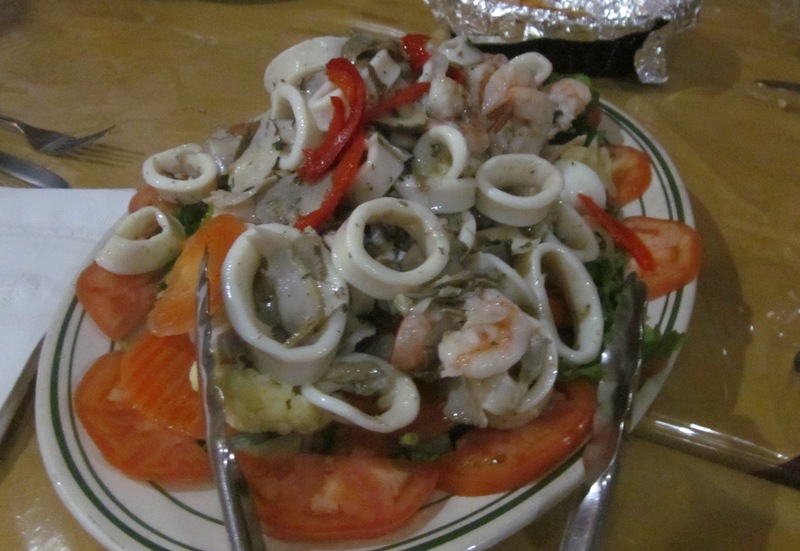 Overflowing with calamari, shrimp, and, as a bonus for those who care about such things, sliced tender scungilli, the seafood salad was served family-style to the extreme and more than enough even for our gluttonous family. 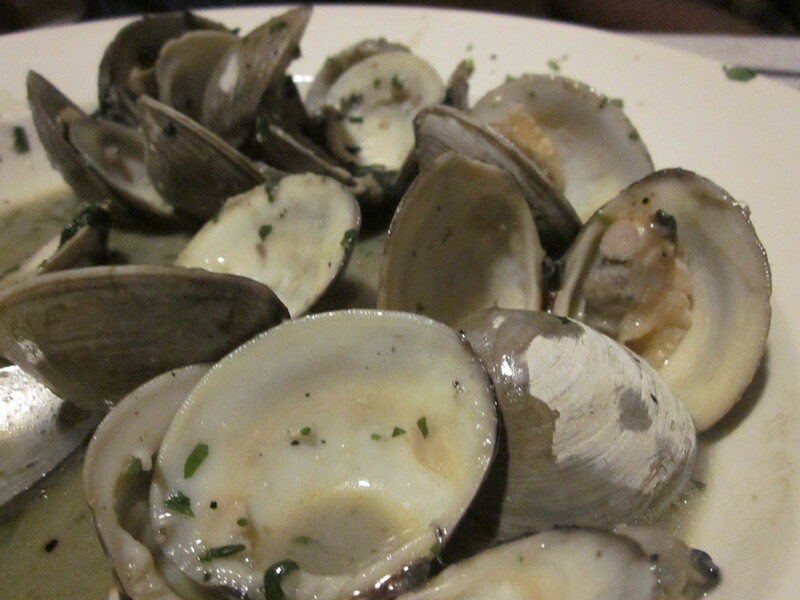 The baked clams, though far from the best in the city, were good enough to quickly leave 12 empty shells floating on the oily breadcrumbs that remained on the platter. “Whaddya gonna order?” I asked Zio. “I dunno. I think a sandwich,” Zio responded with a straight face. 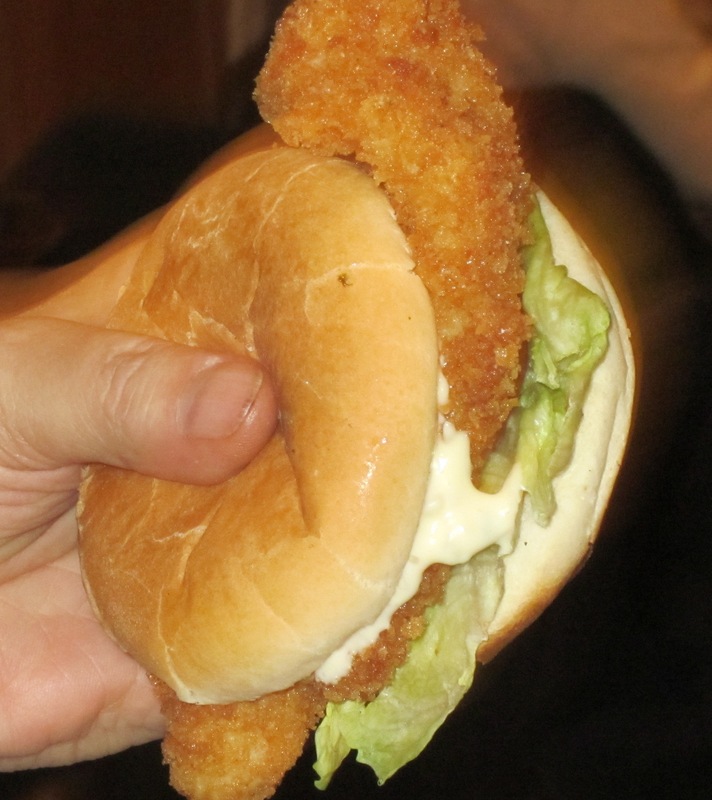 “A fish sandwich? Gerry joked, reminding Zio of his unfortunate choice at our last destination, The Cutting Board (Uni and Ovaltine). Keeping it safely within the red sauce barometers, I chose baked ziti with meatballs while Rick went with the white clam sauce and Eugene the red. Gerry veered somewhat by ordering the penne with sausage and broccoli in a white sauce. Saddled by a mild gluten allergy, Mike from Yonkers had to refrain from pasta instead choosing the balsamic chicken—with a side salad. Soon enormous platters began to arrive on the already olive oil stained vinyl tablecloth. The pastas and entrees were all very close to family size. I picked at the baked ziti; the anticipated red sauce overly sweet and not up to my very high standards while the meatballs, though spiced correctly, a bit leaden. Zio’s veal and peppers, on the other hand, were smothered in a more piquant red sauce and outstanding. Who says they don’t know red sauce in Venice? I looked at Rick’s platter of linguini with white clam sauce. “Are they canned?” I asked, referring to the clams. Rick nodded. “Yeah, they’re canned, but I’m not complaining.” And neither was Eugene who, working silently and with purpose, slowly devoured his monstrous platter. The rest of us, however, on this evening, just did not have the stamina Eugene had and, possibly a first in the 12 years we had been doing this, had no choice but to ask the waiter to bag up half of all our respective dinners to be eaten for lunch the next day. 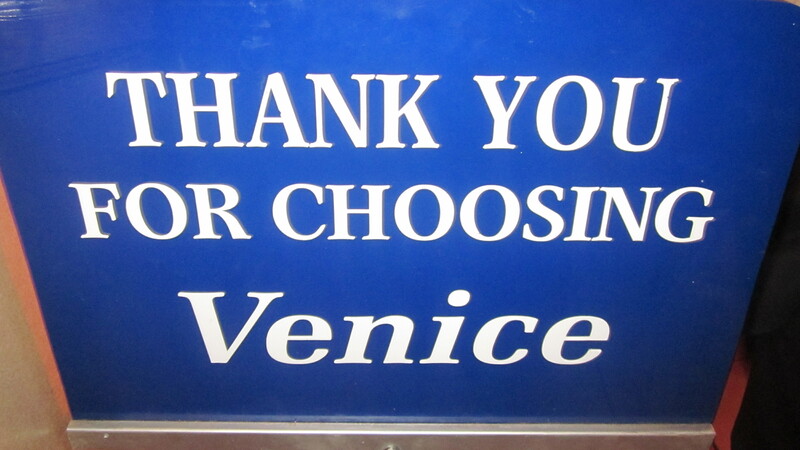 As we headed to our cars in the private, security-maintained parking lot, no one had much to say about Venice which was maybe an indication why it had remained “undiscovered” for over 60 years. 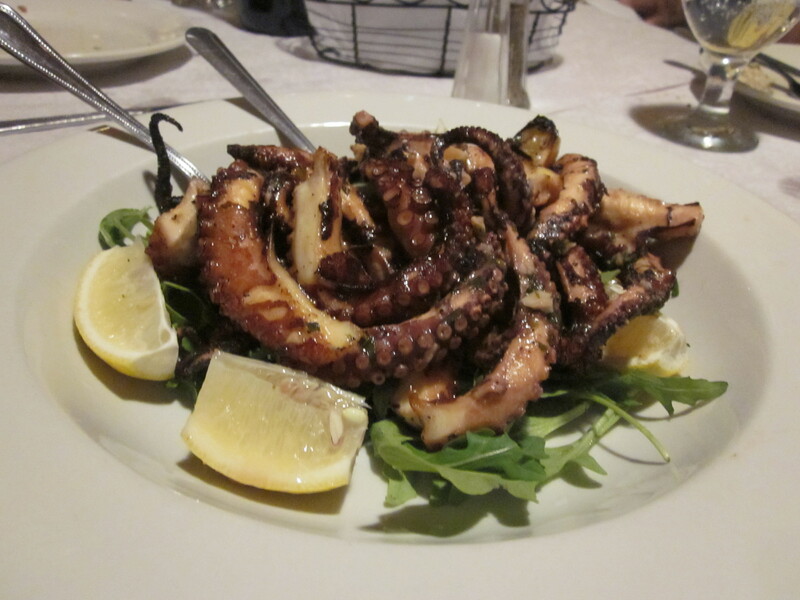 But despite the restaurant’s mediocrity, we were able to all convene again as a complete group and over a seafood salad that included scungilli. We couldn’t really ask much more than that. I was in the rest room of the Cutting Board, on Bayard Street in Chinatown staring at the cheery murals in front of me when I heard Zio’s voice. I got to the restaurant before Zio and he must have come in just behind me because now I could hear him speaking loudly from our table. “I waved to him a few times: no response!” he said incredulously. Was he referring to me? I cleaned up and headed back to our table. He looked at me. “You just ignore me on the street?” Zio asked. “Did you call out my name? Did you say hello?” I asked. It was another frigid night. Chinatown’s sidewalks were even narrower and difficult to navigate on this evening; dark overstuffed plastic garbage bags piled on top of, and next to gray mountains of ice that had not yet melted from the winter’s multiple storms crowded the sidewalks. I had my head down and was walking with a purpose. I was hungry. I just wanted to get out of the cold and to our destination. Even if my head were up, I would not have noticed Zio. His rotund physique, stuffed into a dark down coat, rendered him camouflage amongst the garbage bags on the street. But I didn’t tell him that. “Why would I be looking?” I said instead. He just shook his head and stared down at the menu. Something we all decided to do. 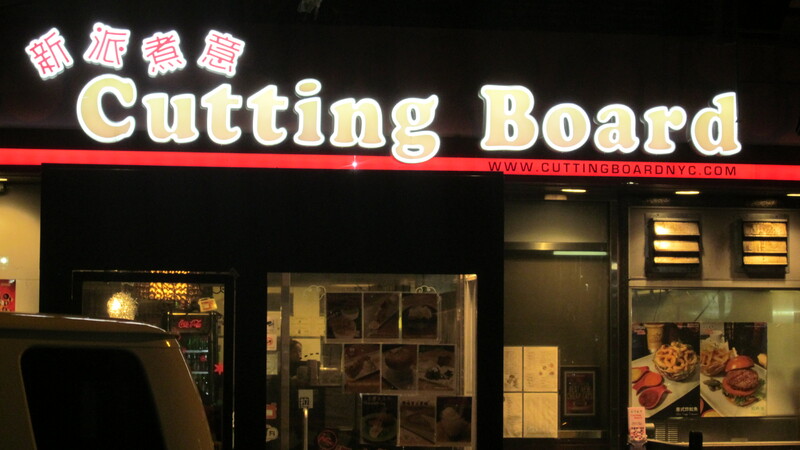 .The Cutting Board was my choice and picked because it was, according to my research, an odd amalgam of cuisines with a heavy Asian accent. Here you had your choice of Western starters like chicken wings, chicken tenders, and fried calamari, or the Asian standards; bbq spare ribs, edamame, and shrimp toast. And then there were the blending of cuisines like the Cajun fries with seaweed, the Caesar salad with pork katsu, or even the pasta with uni. For a man who had been dining with our group for 12 years, eating just about every type of ethnic food offered in the Tri State region, Eugene’s lack of food knowledge was disconcerting. “Sea urchin,” Gerry told him. “That spiny mollusk you don’t want to step on in the ocean,” I said. “You scoop out the creamy stuff inside…” I tried to explain but wasn’t doing a good job of it. Eugene’s food curiosity was as impressive as his food ignorance. One canceled out the other in my opinion. No one at our table could really define the taste of uni. It was more about its consistency. Undaunted, Eugene put his menu down. “I’ll have the spaghetti with the sea urchin,” he told the waiter. On the menu was something I had not seen before in a Chinese restaurant much less any other restaurant called “creamy rice.” Could it be a bastardization of Italian risotto? The idea was enough to convince me to give it a shot and I chose mine with “fatty beef.” Also intrigued by the concept, Mike from Yonkers tried the creamy rice with grilled chicken, which the waiter mentioned was one of the more popular items on the menu. And then the waiter was hovering over Zio. He just shook his head. “I…don’t know…” he muttered. We started with a bowl of clams steamed in light red tomato, wine sauce that was good enough to soak up with a loaf of crusty bread. Unfortunately all we were given was one thin slice of garlic bread. Along with the clams were the thinly sliced, tender barbecue ox tongues and a side of Cajun fries salted with dried seaweed. Also arriving was Zio’s Ovaltine. The promised sip was offered to me. 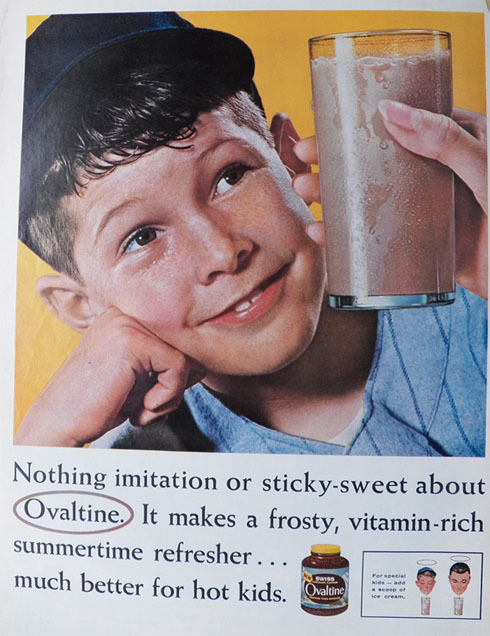 It had that same, bland taste with just a teasing hint of chocolate I remembered the last time I sipped an Ovaltine; probably 40 or more years ago. I chased the Ovaltine with a gulp of Sapporo beer and returned the paper cup to Zio. Our main dishes came soon after we devoured the starters with Eugene’s spaghetti with sea urchin the first to arrive. In the menu the sauce was described as a “pink creamy.” What appeared in front of Eugene had more of a yellowish hue to it. He shared with all. 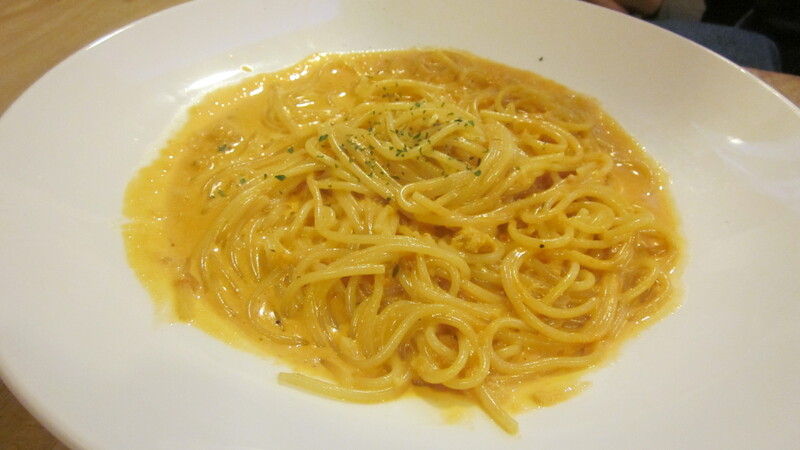 The spaghetti was, as if I expected otherwise, overdone, the saltiness of the sauce the only indication that there was uni in it. Maybe it melded with a light tomato sauce to form the creamy, yellow consistency? Either way, Eugene was pleased and that was really all that mattered. 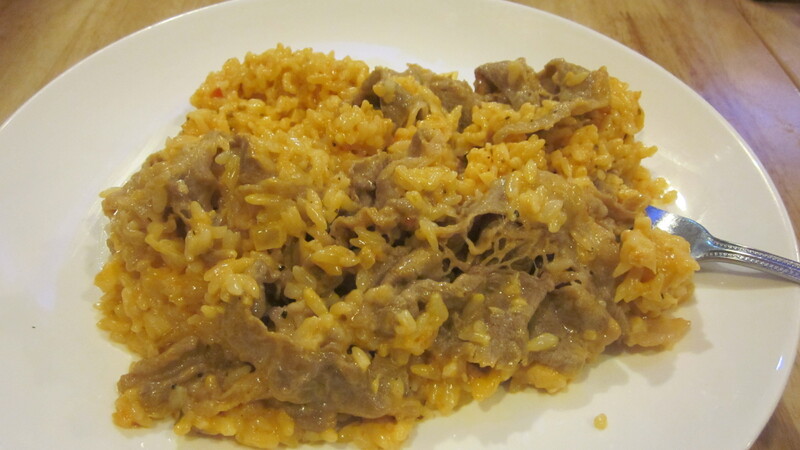 The creamy rice with the fatty beef that I was hoping would resemble Italian risotto was closer to Campbell’s tomato rice soup with thinly sliced chipped beef as a topping. But I didn’t hold that against it. 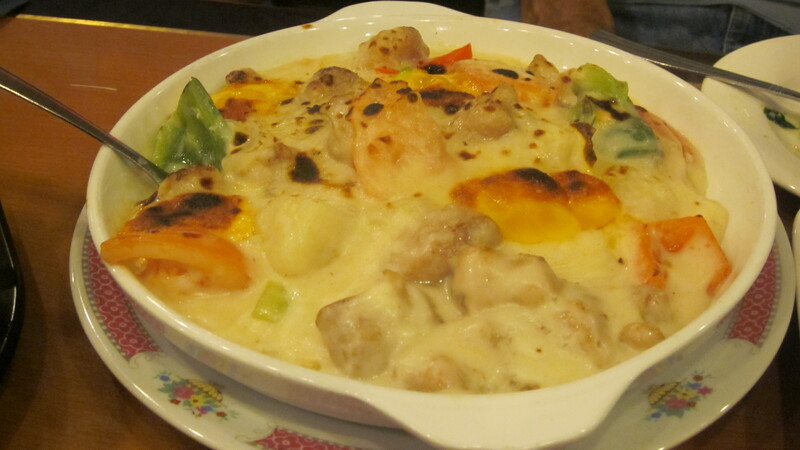 The dish was hearty and comforting and Zio, who I shared some with, agreed. The comfort level increased when Gerry’s classic beef curry arrived. More a diner/comfort food concoction than anything purely Asian, the beef was ground and the curry sauce strong flavored like the kind you might have found in a curry dish prepared in the UK decades ago. Topping the dish was an egg over easy and a side of potato salad. And all of that for only six dollars. You really couldn’t get much more comforting. Finally Zio’s fried fish sandwich arrived and was no different than any other fried fish sandwich you might find in a thousand restaurants and delis throughout the city. Zio made sure to apply tartar sauce. Eugene had cleaned his plate of spaghetti and uni and nothing remained of either my creamy rice with fatty beef or Gerry’s classic beef curry. We all looked toward Mike from Yonkers. “Some things never change,” Eugene said as he watched and waited while Mike from Yonkers deliberately and methodically ate his creamy rice with chicken. “I like to savor my food,” Mike from Yonkers said in response to he always being the last to finish. With that, Mike from Yonkers shoveled down the last kernels of creamy rice and the five of us left the warmth of the Cutting Board for the icy streets of Chinatown. 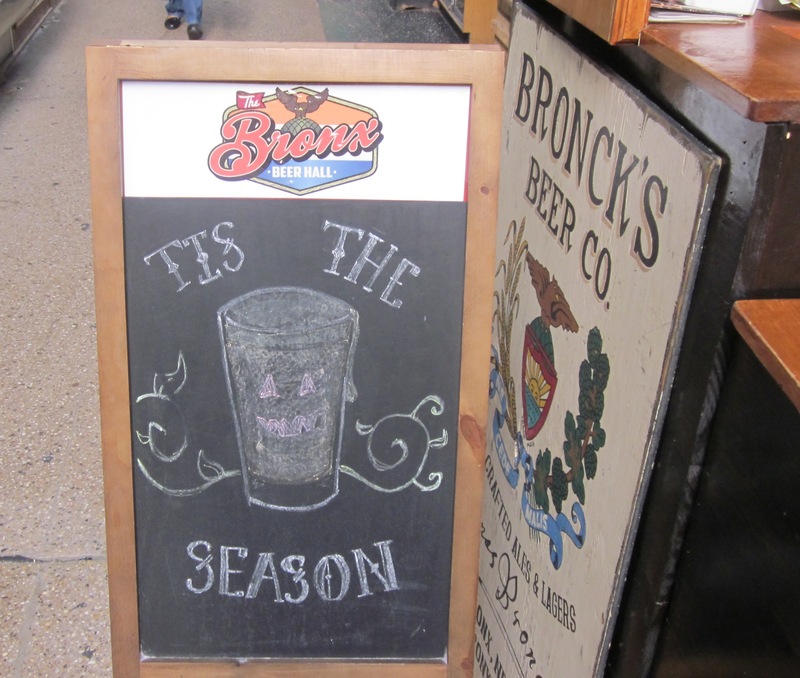 “Happy hour is two for one,” the bartender, a woman in a black “Bronx Beer Hall” t-shirt told us as we settled into chairs at the bar in the relatively quiet Arthur Avenue Retail Market where the Bronx Beer Hall was located. Despite the calm inside, Eugene was having trouble hearing. “Whats’ that?” he asked the bartender while bending over the bar, his hand cupped over his ear in a feeble attempt to hear her. I was with the Westchester contingent; Gerry and Eugene of the Adventures in Chow City group for a pre-meal drink before one of our interim dinners at a restaurant a block up on 187th Street. “She said it’s two-for-one,” I said to Eugene in a voice loud and clear enough so he could hear me. “Buy one beer and you get the second free,” the bartender, who we later learned was a senior at nearby Fordham University, explained. I was very familiar with the happy hour concept as was Gerry and, I’m sure, so was Eugene. 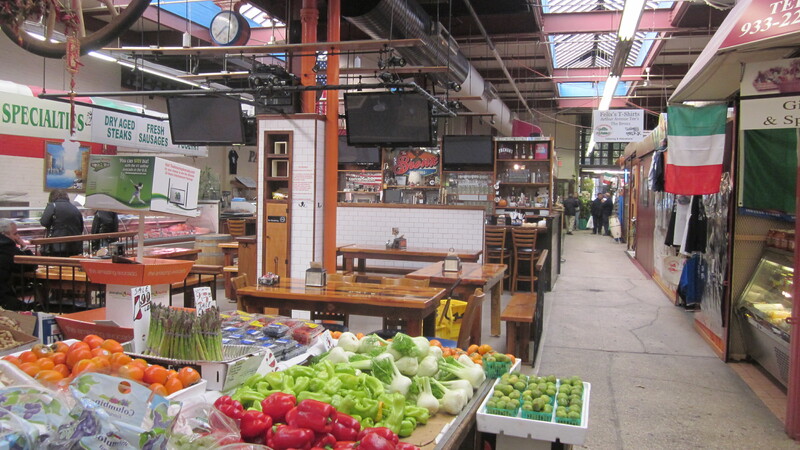 Maybe it was the cavernous indoor market that made it hard for Eugene to hear. Or maybe it was just that he was old and nature was taking its course. 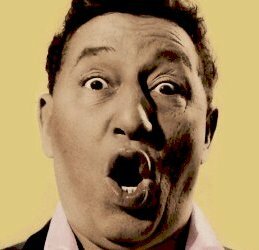 I wasn’t far behind him in age, but I could hear the bartender clearly as well as the falsetto singing voice of Anthony Gourdine, also known as “Little Anthony,” as “I’m on the Outside (Looking In),” played in the background. The beers on tap were mostly Bronx-made, which made me, even without tasting one, very happy. Some were made by the Jonas Bronck’s Beer Company while others were from the City Island Beer Company. One of the day’s specials was the “Kingsbridge Kolsch” made by the Jonas Bronck’s Beer Company. 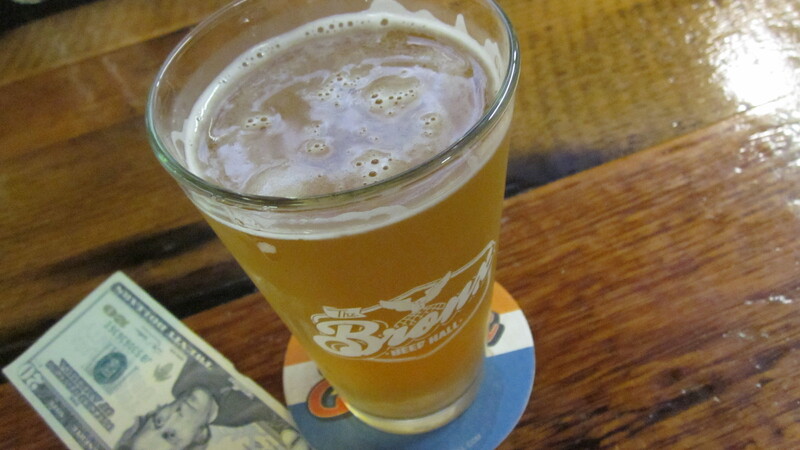 I was given a sample and immediately after tasting the fragrant icy blonde I ordered a pint. “I’ll have one of those also,” Eugene told the bartender. “Big Apple Cider,” Gerry said to her, also one of the blackboard specials. “Cider?” I had never known Gerry to order cider, hard or not. “It’s supposed to be good for gout,” he said. I didn’t want to know more than that. The beer was cold and delicious. We chatted with the bartender who, with the exception of only two other customers, had only our group to attend to. “You get a lot of Fordham students in here?” I asked knowing the proximity to the Fordham campus and recalling my own now very distant college days and how loyal I was to the two-for-one institutions near my university. “You didn’t card us,” Eugene said, feigning outrage. Gerry looked at me. I looked at him. Was she going there to be funny or did she not know any better. Either way there was no need to dwell further on the Bronx Beer Hall demographic. My beer was empty. It was time for the second of the two for one. 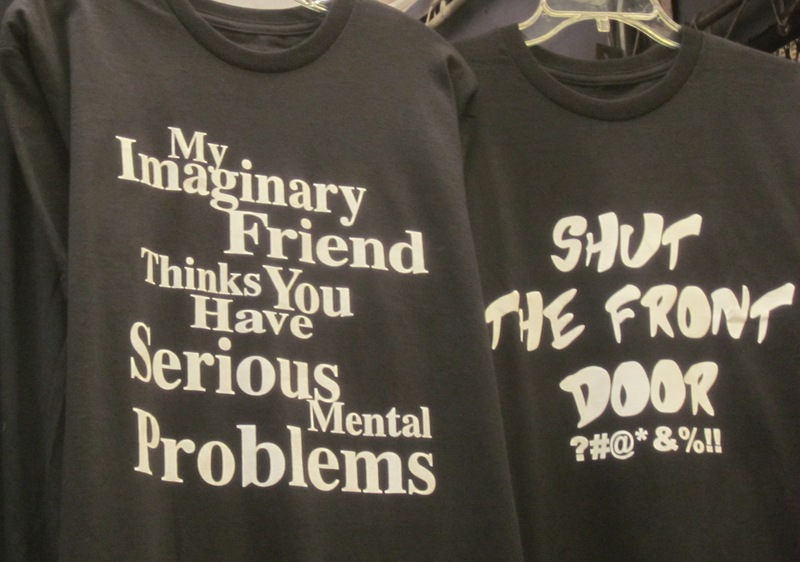 I glanced at the t-shirts for sale in the t-shirt booth next to the bar. Most were Italian-themed with stereotypical slogans like “fuhgeddaboudit” and “Leave the gun, take the cannolis.” There was a whiff of tobacco coming from the adjacent cigar factory, La Casa Grande Tobacco Company. Our bartender wanted to know if we were interested in food from Mike’s Deli, one of the most popular spots within the market. We declined, telling her we were eating at a nearby restaurant. While we sipped the delicious Bronx beers, Eugene began reminiscing about the “old days,” back in White Plains and if we knew so and so who was once very pretty but, “you should see her now.” And then he started talking about his recent 40th high school reunion including listing off several names of people unable to attend due to the fact that they were no longer alive. I drained my second pint while over the loudspeakers in the now almost deserted market, the Crests were singing “Trouble in Paradise.” Another two-for-one round of Kingsbridge Kolsch was a temptation. I hadn’t eaten; more beer on an empty stomach would be a serious mistake. “Where’s the bathroom in this place,” Eugene wondered out loud. “I was gonna ask the same question,” Gerry said. I looked at my empty glass; only a thin foamy head remained on the bottom of it. If I have learned anything over the years, it was to know my limitations. Arthur Avenue in the Bronx, once a prominently exclusive Italian/American neighborhood, has over the past couple of decades, opened its welcoming arms to immigrants from other countries, in particular Albanians. 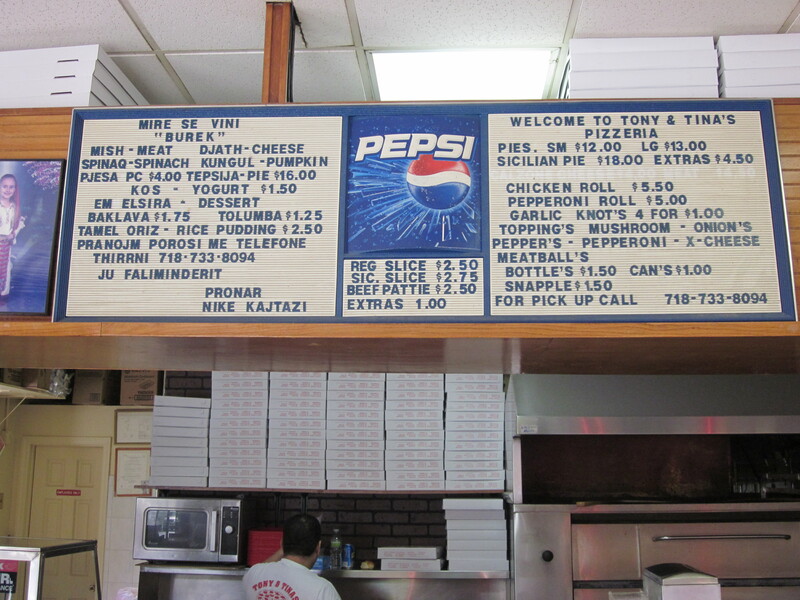 Arthur Avenue: where pizza and bureks live in harmony. You will also now find Mexican and Japanese restaurants nestled side by side and close to both an Italian cheese store and a dried sausage place where they co-exist peacefully. But Arthur Avenue can be fickle about newcomers. 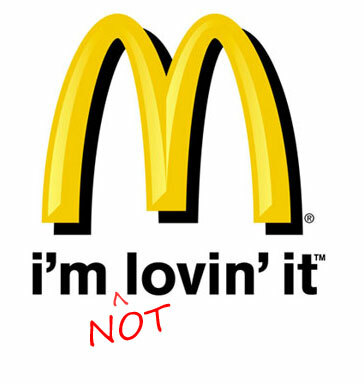 Several years ago, McDonald’s made an attempt to infiltrate the block. Thankfully they were soundly rejected. No love for McDonald’s on Arthur Avenue. 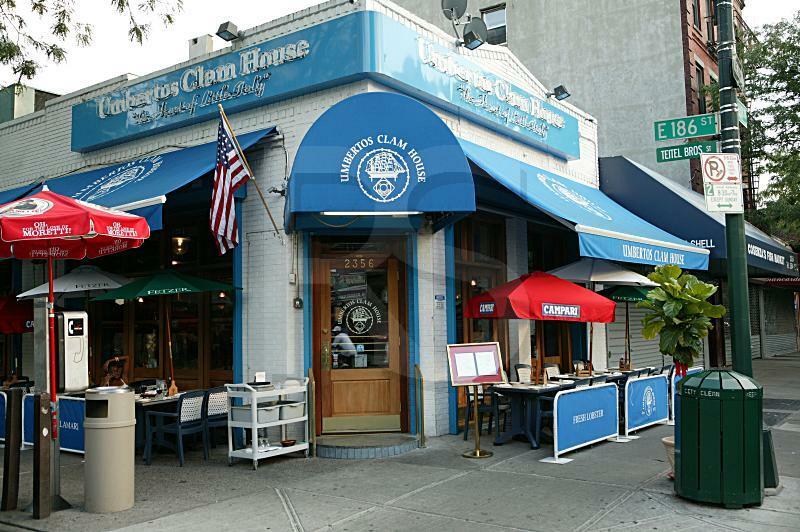 And then a legendary downtown seafood joint, Umberto’s Clam House; it’s legend born from the graphic and gruesome blood and tomato sauce murder of a famous mobster, tried to make it in the Bronx on Arthur Avenue on the site of what once was a live poultry store. Tourists came, but no mobsters. Umberto’s tenure on Arthur Avenue was longer than McDonald’s, but whether it was just because most people can’t name the mobster who was gunned down at the original Umberto’s it was so long ago, or that the ghosts of thousands of butchered chickens have cursed the location, it is now gone, replaced by a “Mediterranean” restaurant. 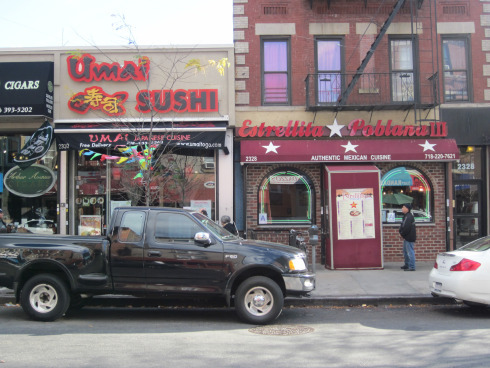 …should Arthur Avenue accept this new interloper from downtown? 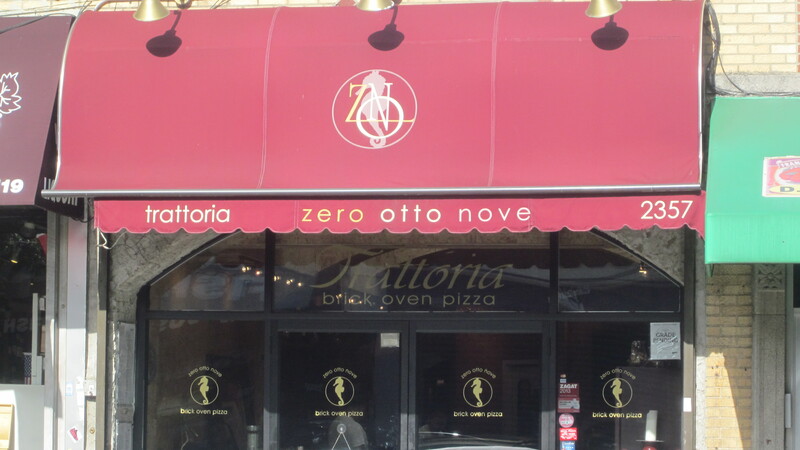 Can another pizzeria survive on this glutenous stretch of landscape? Will the display of co-allegiance to the Garden State forever diminish the reputation of this fabled establishment? And finally, will the restrictive and somewhat haughty “no slices” policy be amended to reflect the open door sensibilities of the neighborhood? Every August or September, Goomba Joe, who I wrote about in these pages regarding his meatballs (Goomba Joe’s Polpette), would invite my family up to his apartment for dinner where one of the courses would undoubtedly be what he called “pasta crudo,” or tomato sauce in the raw. 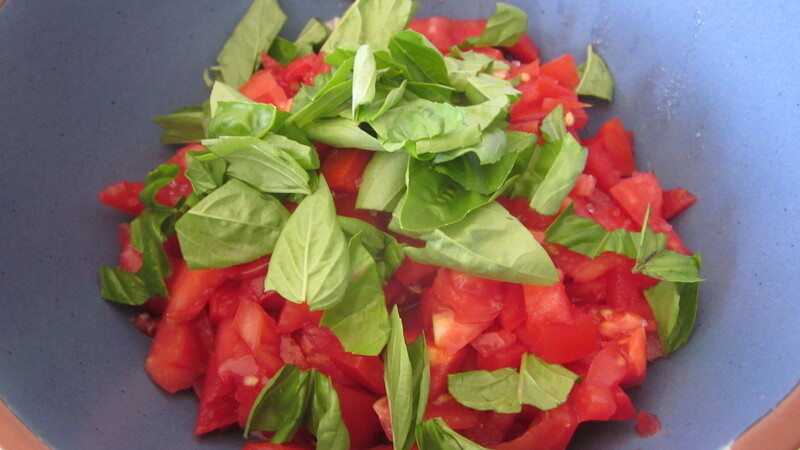 He had a small terrace where, with limited sun, he grew enough tomatoes for a few batches of this uncooked tomato sauce. Goomba Joe is sadly gone, though now my family has a spacious sunny terrace where, using planters, we can usually grow enough tomatoes for more than just a few batches of pasta crudo. This year because of, let’s see, a cool spring, too much rain, a brutally hot early July followed by a cool August, culminating with an invasion of tomato hornworms—or any other excuse I can come up with—the terrace tomato crop has been paltry . As of this writing, however, they are making a strong late season comeback and their bounty has yielded enough for at least one good batch of pasta crudo. 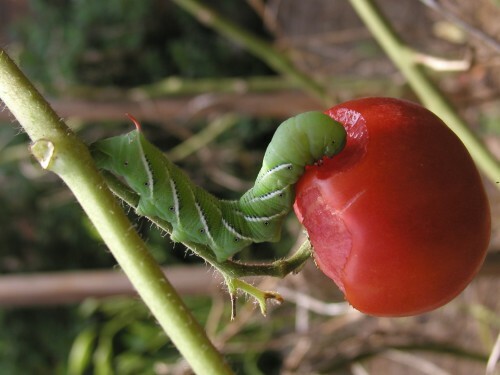 The hornworms like their tomatoes raw. There really isn’t much to making uncooked tomato sauce. 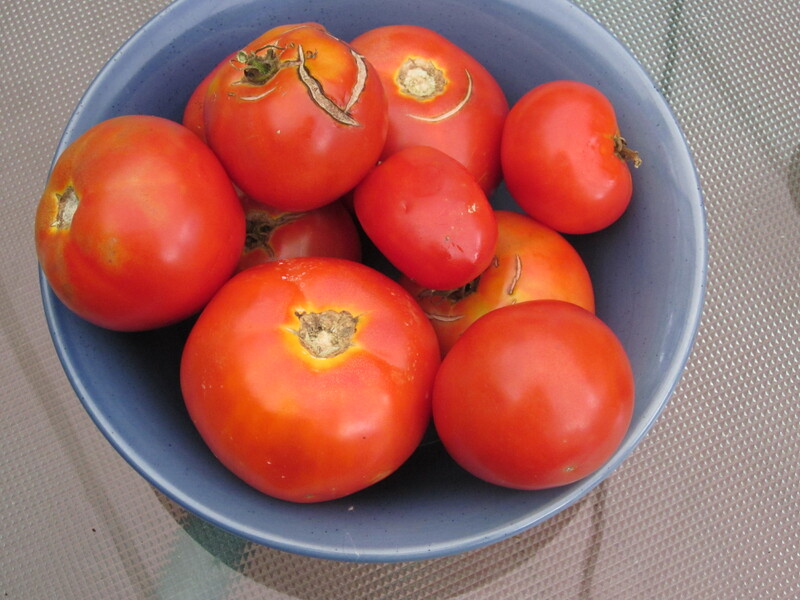 If your tomatoes are ripe, in season summer tomatoes, you can’t go wrong. The sauce is not exclusive to pasta. It can be used as an Italian salsa or, even better, slathered on crusty bread as a bruschetta topping. 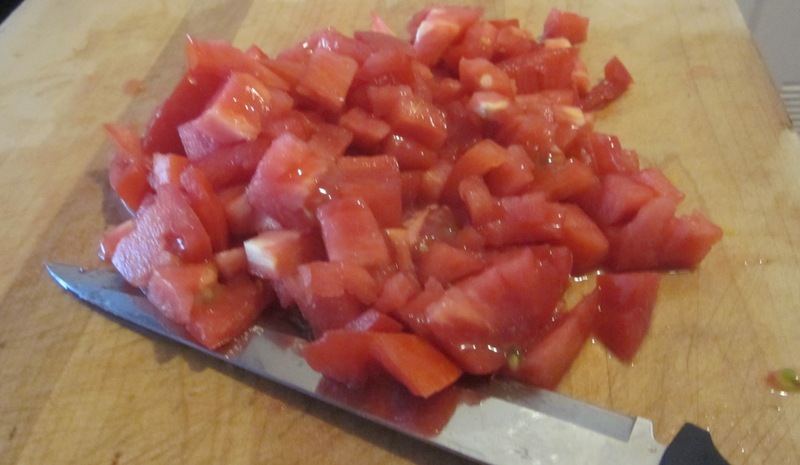 Put the chopped tomatoes into a non-reactive bowl (glass or ceramic). Add all the other ingredients and mix delicately with a spoon. Let the sauce sit or “macerate” for at least one hour. The tomato sauce can sit at room temperature for up to eight hours, any longer I recommend refrigerating and then pulling them out of the refrigerator at least an hour before serving. Meanwhile cook one pound of pasta. For this, I used fusilli, but spaghetti works well too. When the pasta is al dente, drain and add the sauce, mixing well. 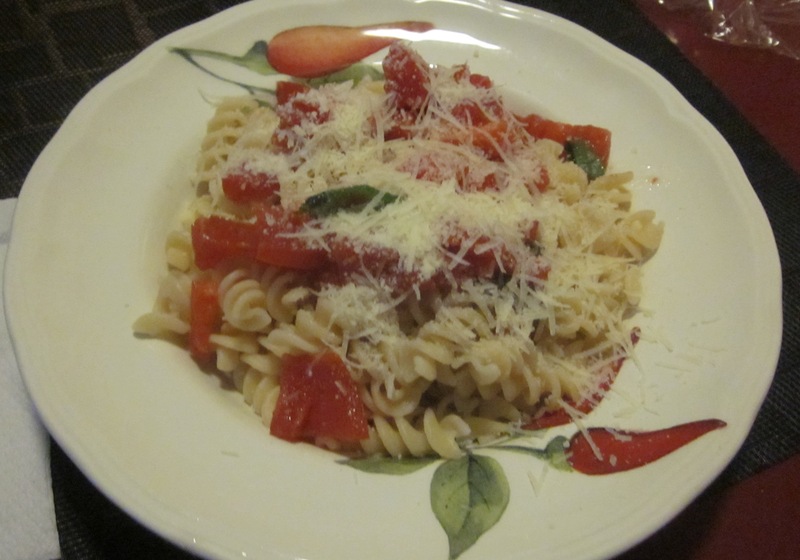 Sprinkle generously with grated Parmesean Reggiano or Pecorino Romano. Tomato sauce in the raw. *If you have an aversion to raw garlic even though it has softened during the maceration process from the salt and the acid from the tomatoes, slice or chop it into bigger pieces before adding it to the sauce and then remove it just before serving. Why you would do this, I don’t know. I was the first to arrive at Café Hong Kong in Chinatown on a steamy evening when the cramped sidewalks of Bayard Street were overflowing with black plastic garbage bags, their stench signifying the true arrival of summer. Rick had again passed on his appointed pick for our group, this time giving us a week’s notice instead of a day. Because of the semi-abrupt announcement, I suggested we convene at Café Hong Kong and resume our scheduled picks with Rick again attempting to commit to our next dinner, followed by Mike from Yonkers. Café Hong Kong was packed when I arrived, but a table was put together for the five of us. When I sat down alone, a harried waiter immediately inquired if “my friends were coming.” I told them that they were. He quickly returned with tea. “They coming now,” he asked again anxiously not daring to experience the ownership’s wrath by holding a table when other paying customers were waiting. “As far as I know, they are on their way,” I said and then sent out urgent texts to Zio and Gerry to find out their whereabouts. I cursed under my breath. Zio had informed us that he had a commitment on the Lower East Side on the same day we had chosen. The Chinatown location of Café Hong Kong was picked in an effort to accommodate him. And he didn’t read the emails. Thankfully, Gerry responded that he was close and would arrive very soon. While I waited, I flipped through the menu noticing immediately, the curious section titled “baked rice/spaghetti.” Also offered were bizarre—at least for Chinese food—options Chinese such as ham and egg sandwich, bacon and egg sandwich, and borsch (sic) soup. 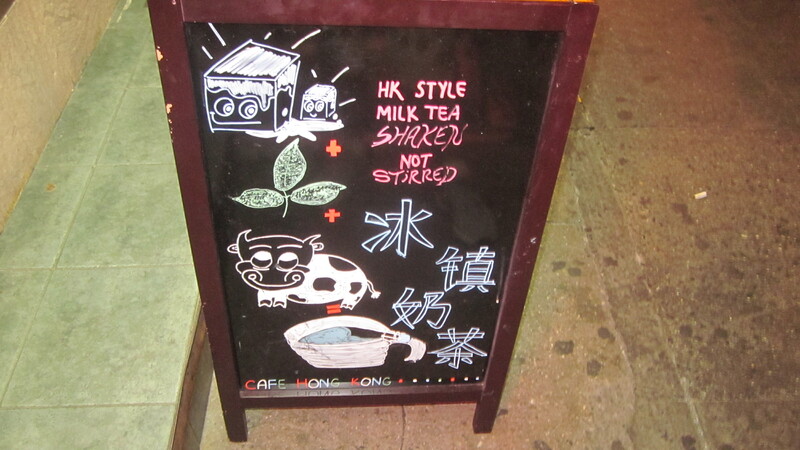 This was a “café,” however so allowances were made and along with Hong Kong-style milk tea, cappuccino, lattes, and macchiatos were on the full espresso bar menu. When Gerry and Eugene arrived, our table was proclaimed legitimate and I was no longer harassed by the equally beleaguered waiter. Mike from Yonkers informed Gerry that he would be coming from the train and might be late. We were hungry and instead of waiting, ordered a soup, fish with bean curd, an appetizer, sweet and sour fish filet, and pickled sour radish. Just as the reddish orange, sweet and sour fried fish filet, complete with the familiar pineapple chunks, arrived, Mike from Yonkers made his sweaty entrance. The hot soup came next, administered by a more patient waiter into four smaller bowls. The soup dampening Mike’s shirt even further and his perspiration creeping alarmingly close to my food. After a few sips of the soup, fragrant with ginger, the broth refreshingly light and with chunks of fish and tofu, I no longer cared about Mike from Yonker’s sweat. Soup for a hot summer’s day. What to order from the vast menu was our next business. Gerry warned me about the “baked” dishes when I asked if I should dare try one. “I don’t know—baked pasta?” he said dubiously. But I couldn’t resist. Where else could I have pasta, baked no less, in a Hong Kong-style café unless I ventured to Hong Kong and that was not happening anytime soon? 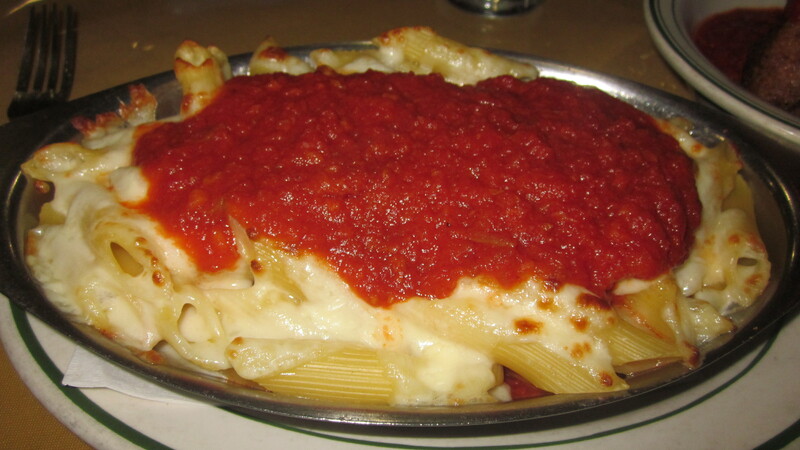 I couldn’t, however, even though I was sorely tempted, choose the baked pasta Bolognese. Instead I decided on the baked beef stew. Eugene also picked from the baked section going with the coconut chicken. 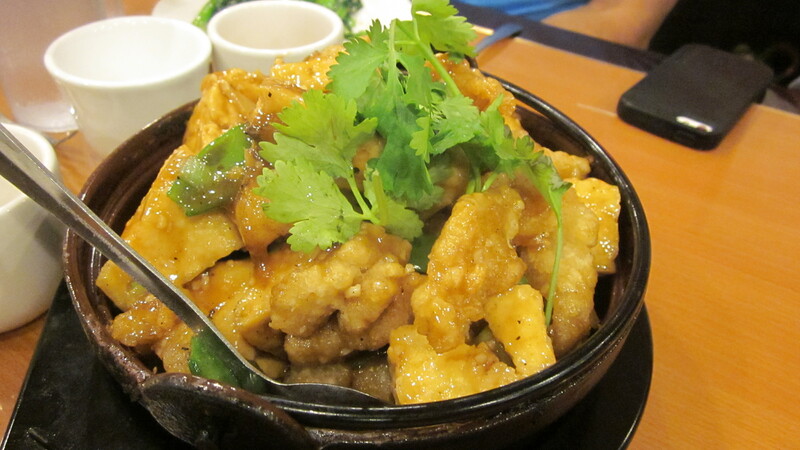 Sticking to more familiar and traditional Cantonese dishes, Gerry went with the salt and pepper squid while Mike from Yonkers decided on the fish filet bean curd casserole. 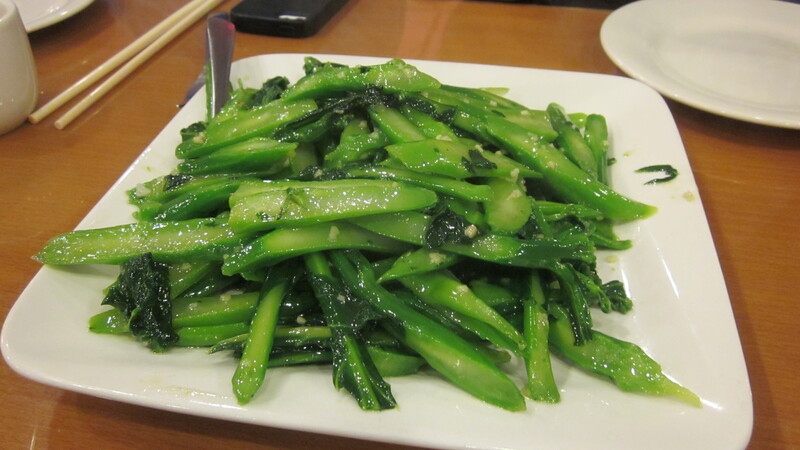 Sautéed Chinese broccoli with garlic completed our order. While we waited for our dishes to arrive, I noticed that there was a missed call from Zio. The sautéed Chinese broccoli came first. I quickly snapped a picture of the dark green, perfectly steamed broccoli on my phone camera and sent it to Zio. And then the enormous bowl of baked beef stew, the tomato sauce congealed on top of the spaghetti from the baking process. The baked coconut chicken also had a semi-hard topping, a few burn marks speckling the white exterior. Just as I sent Zio more of the pictures to remind him of what he was missing at Café Hong Kong, his rotund frame appeared in front of us, and to all of our surprise, with the Colonel in tow. There was no room at our table and Zio and the Colonel grabbed an adjacent table. I muttered a quick hello and then tasted the sweet and sour “tomato” sauce that was drowning the overcooked spaghetti. Complete with thick layers of gelatinous fat over morsels of beef along with chunks of bland tomatoes, even a few tablespoons of freshly grated Parmigiano Reggiano, if offered, could not rescue this dish, Worse was Eugene’s coconut chicken featuring the same overcooked pasta with a white, sweet coconut cream Alfredo sauce, pieces of what seemed like canned carrots and peas, and chunks of chicken. The creation was like a Paula Deen nightmare. And you really can’t get much scarier than that. Sweet and sour Chef Boy Ar Dee. Gerry’s salt and pepper squid was good, but not up to nearby Great New York Noodletown’s standards while the fish and bean curd casserole Mike from Yonkers ordered was a true winner. I realized that ordering the baked pasta at Café Hong Kong was like going to a burger joint and then ordering linguini with clam sauce. I should have known better and had no one to blame but myself. The winner: fish and bean curd casserole. As we were leaving, Zio and the Colonel were about to order the coconut chicken. Despite the unfortunate baked beef stew experience, I was in a benevolent mood and warned him off it, instead I gestured to the beef stew; making it his penance for not reading his emails. We said our goodbyes and went to cleanse our palates at the nearby Chinatown Ice Cream Factory. “Thanks for that,” he replied.